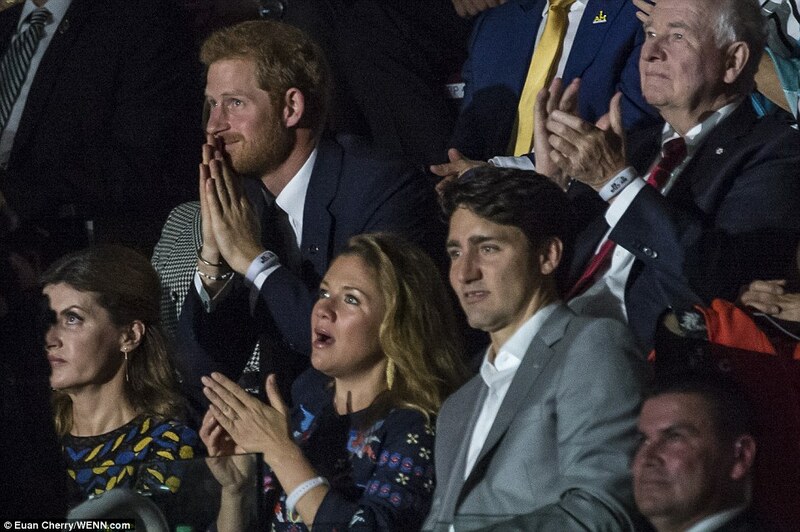 Prince Harry’s actress girlfriend Meghan Markle joined him at the opening of tonight’s Invictus Games, the first time she has attended an official engagement with the royal. 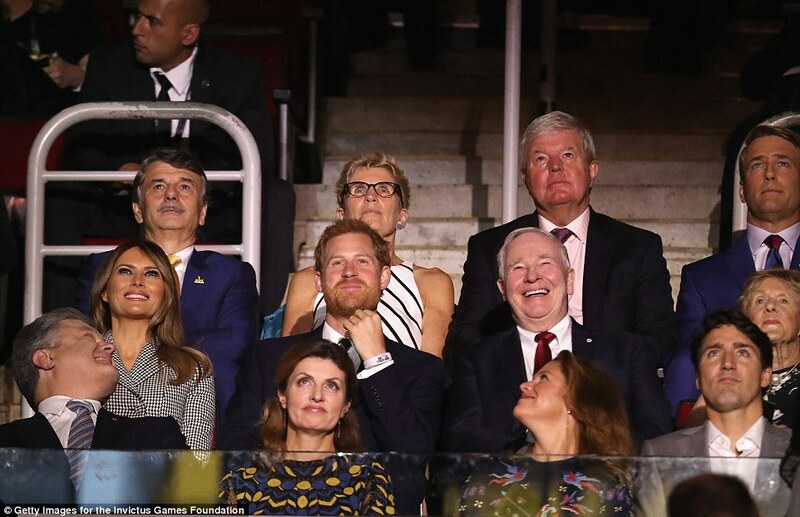 Although the couple were not seated together at the Air Canada Centre in Toronto, she was sat just a few feet away from the Queen’s grandson, who was accompanied by US First Lady Melania Trump. 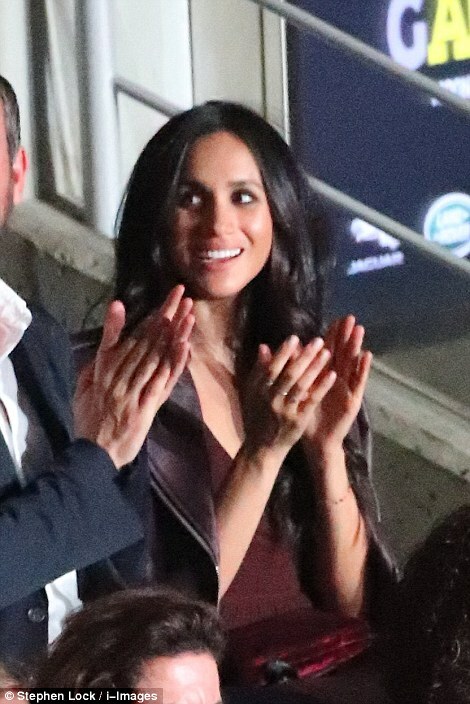 Wearing a purple dress and matching leather jacket slung over her shoulders, she was escorted by her close friend Markus Anderson who introduced her to Prince Harry last year. 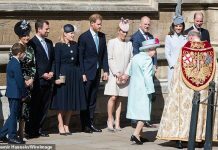 Her low key presence marks the first time she has joined the Royal for an official event and will intensify speculation that an engagement announcement is imminent. 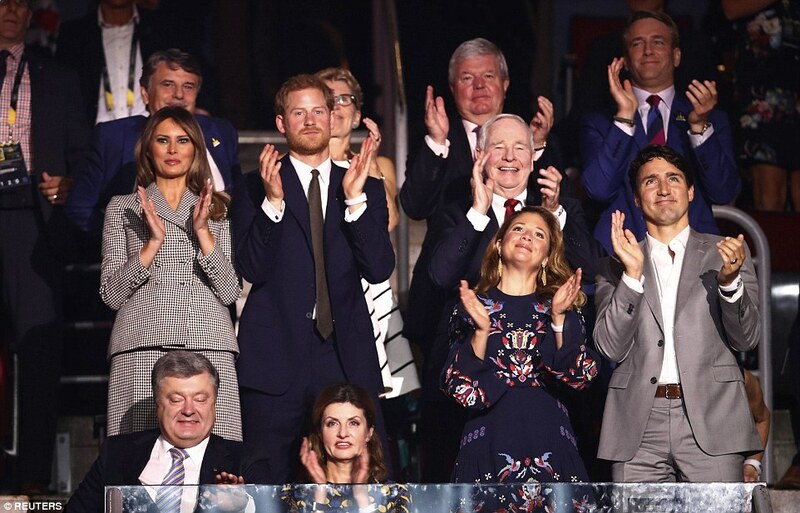 Harry, seated a quarter of a stadium away, occupied a VIP box alongside Canadian Prime Minister Justin Trudeau, US First Lady Melania Trump and Ukraine’s President Poroshenko. 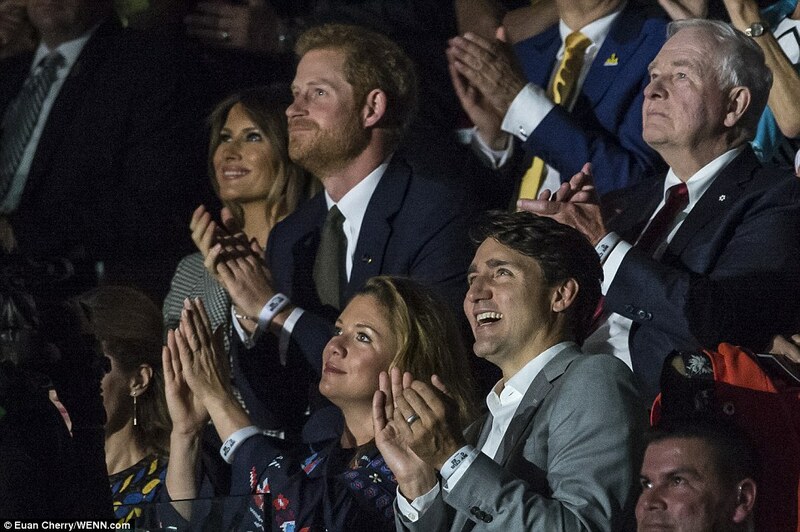 Before she took her seat, the First Lady met with Canadian Prime Minister Justin Trudeau, his glamorous wife Sophie and his children Ella-Grace and Xavier. 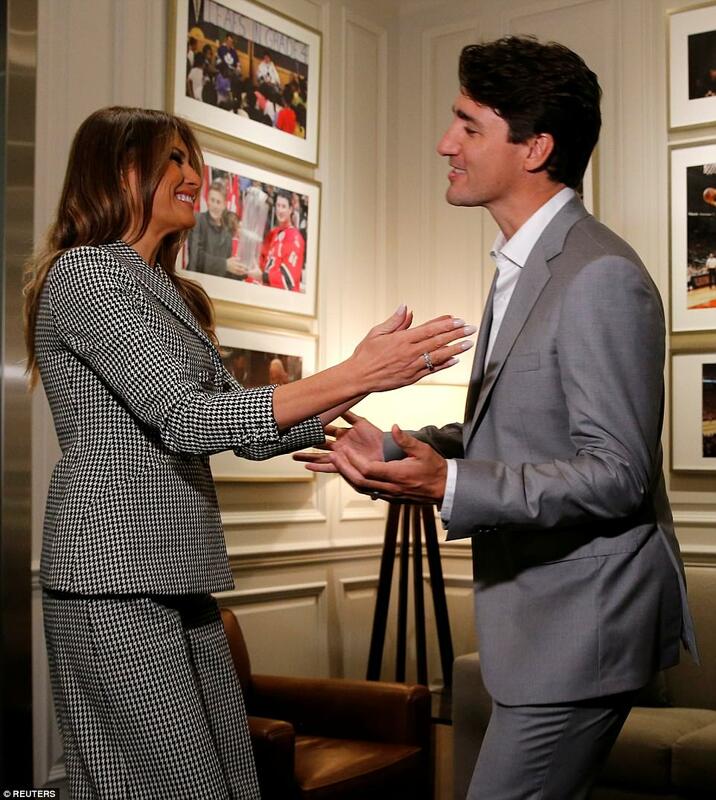 She then chatted briefly to Trudeau about the couple’s children before telling him that her son Barron had spent the day playing soccer. 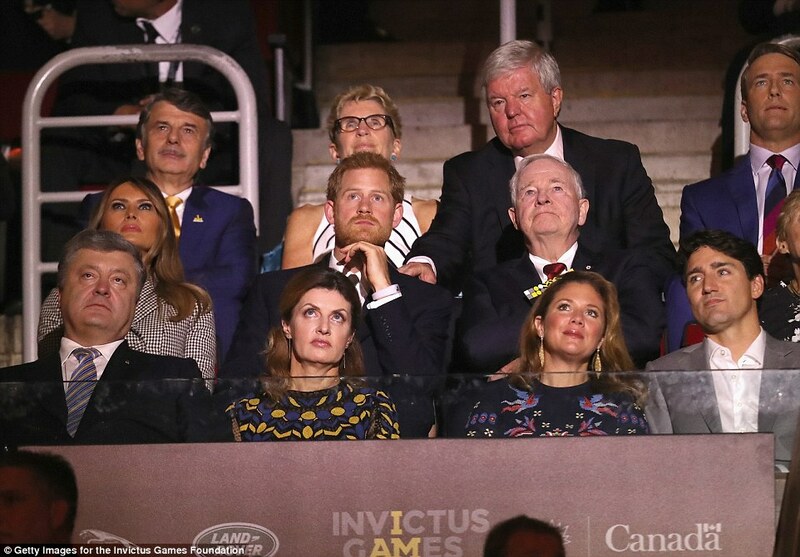 From their vantage point, Harry and Melania had a perfect view of the stage, which was festooned with black and yellow Invictus logos, at the Air Canada Canada Centre. The show itself kicked off late at approximately 8pm EST with a fanfare and welcome before the Parade of Nations, featuring all 550 athletes, commenced. Along with members of the Canadian military, other performers at the musical extravaganza include singers Sarah McLachlan and Alessia Cara and folk band La Bottine Souriante [the smiling boot]. 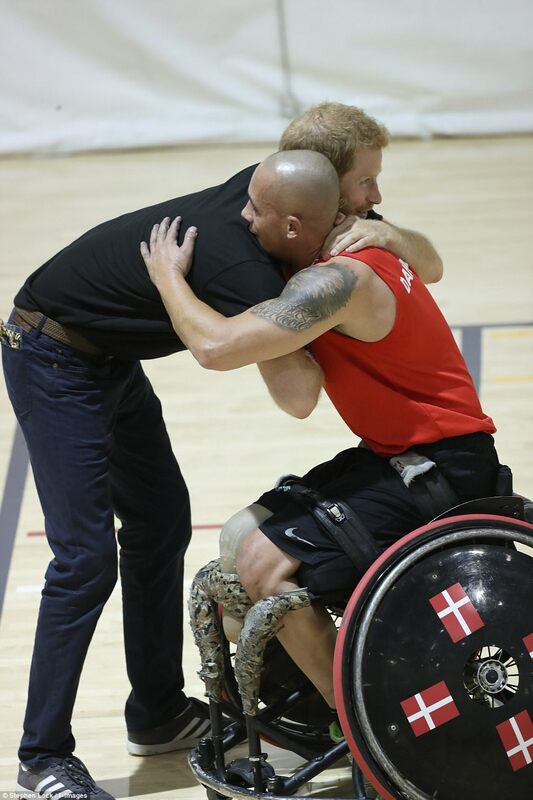 The Invictus Games, now in its third edition, was started in 2014 by Prince Harry and was inspired by the USA’s Warrior Games. Competitors are drawn from 17 countries, including the U.K., USA, Canada and Australia, with the US alone sending 90 athletes. All are former or serving members of the military, many of whom suffered life-changing injuries during combat. Other countries taking part in this year’s event include France, Germany, Estonia, Afghanistan, Iraq and Italy. Servicemen and women from Ukraine, the Netherlands, Denmark and New Zealand will also compete. The event will last a week, beginning with Saturday evening’s celebrity-studded Opening Ceremony and will end with a concert featuring Bruce Springsteen and Bryan Adams. Last year’s event was held in Orlando, Florida, and along with Prince Harry, then Vice President Joe Biden and his wife Jill attended. 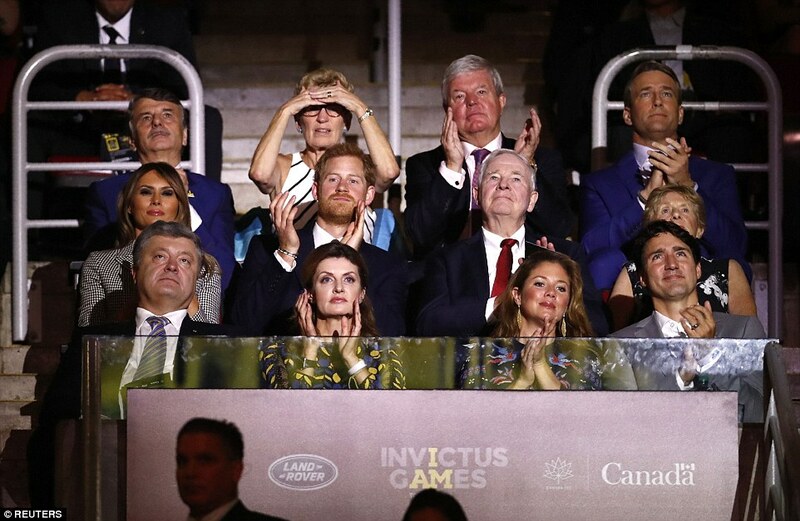 The first edition, held in London, saw senior members of the Royal family descend on the Games, among them the Queen and the Duke of Edinburgh, the Prince of Wales and the Duchess of Cornwall, and the Duke and Duchess of Cambridge. Next year’s event will be held in Sydney, Australia. The name of the Games is drawn from a Victorian poem by William Earnest Henley, written in 1875. 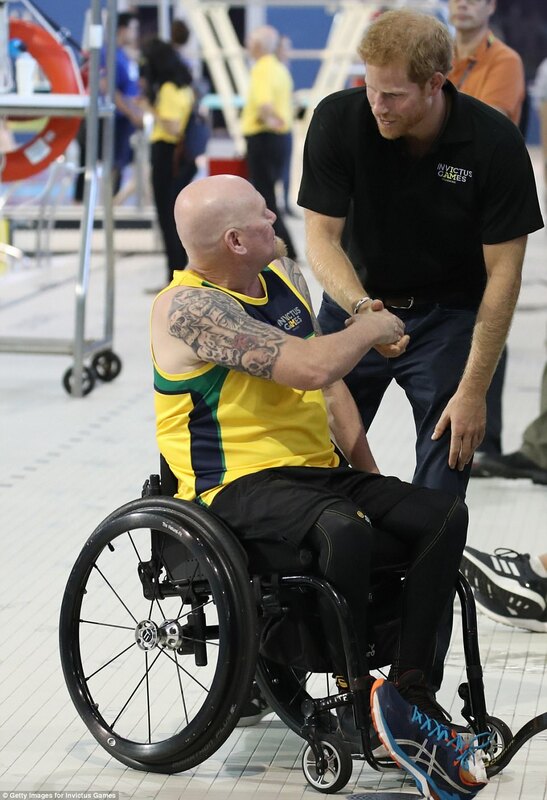 Titled Invictus, the final two lines have become the Games’ motto and read: ‘I am the master of my fate, I am the captain of my soul.’ Henley was himself an amputee and the poem reflects his own battle with illness and adversity. In his case, amputation followed a bad bout of tuberculosis at the age of 12 and for the rest of his life, the red-bearded poet was forced to use a crutch. Despite his injuries and repeat visits to hospital after his other foot became diseased, the journalist and author married and had one daughter, Margaret. He eventually succumbed to tuberculosis at the age of 53 at his home in Woking in 1903 and was buried in Bedfordshire. Prior to the inaugural Games in London 2014, the poem was read in a promotional video by actors Daniel Craig and Tom Hardy. Sporting events, conducted in the style of a Paralympic-type competition, include swimming, archery, wheelchair basketball and athletics. Golf is a new addition to this year’s line-up and rowing, sitting volleyball and wheelchair rugby events will also be held. The mascot at the 2017 event is a cartoon Labrador retriever dog named Vimy. Vimy refers to Vimy Ridge – an engagement during the World War I Battle of Arras in 1917 which saw the Canadian Corps ordered to storm a German position. Previous French attacks had failed, with the loss of 100,000 lives, but the men of the Canadian Corps prevailed, losing 10,000 in the process. 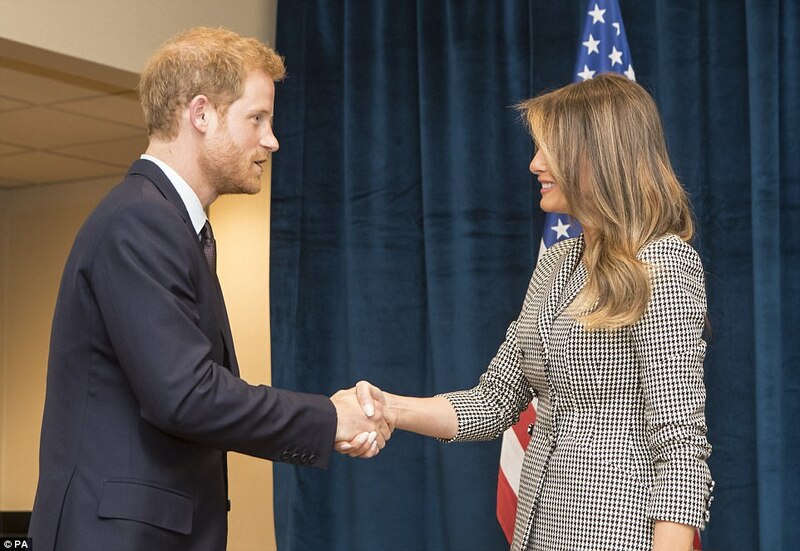 Earlier in the day, Prince Harry became the first member of the Royal Family to meet a Trump since last year’s Presidential Election. 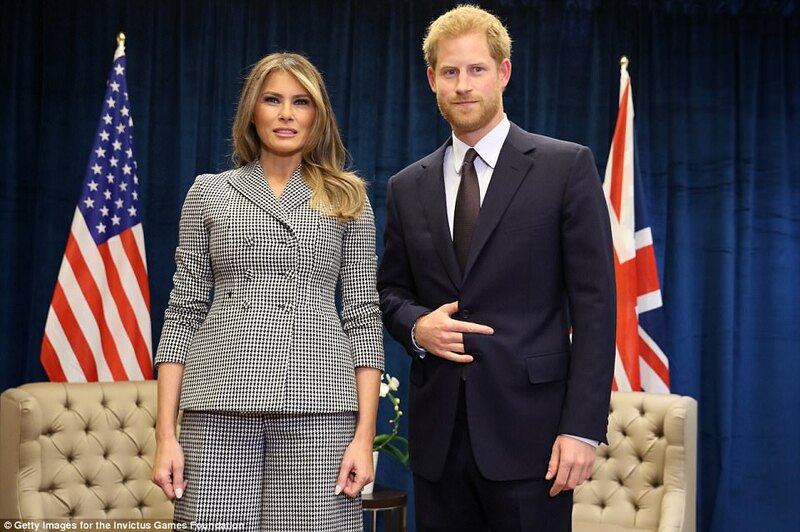 Mrs Trump and Harry spent less than 30 minutes together before the royal left for another engagement – the Jaguar Land Rover Driving Challenge. Despite its brevity, the meeting appeared cordial with the pair warmly shaking hands before settling down to talk in a room at the Sheraton Hotel. 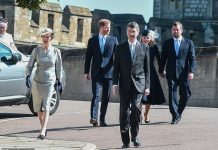 The 33-year-old prince dressed in a dark blue suit while the 47-year-old First Lady wore a tailored black-and-white dog tooth Dior suit and black heels. 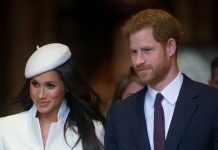 Harry initially appeared awkward when he was introduced to the Slovenian former model, smiling brightly for the cameras before letting it drop as he turned away. 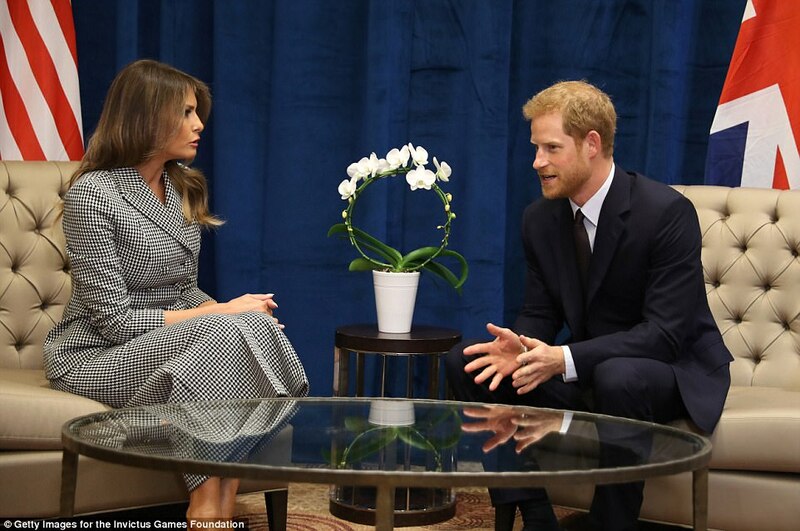 The pair then engaged in small talk with Mrs Trump thanking the prince for coming before he asked her if she had been in Canada long. 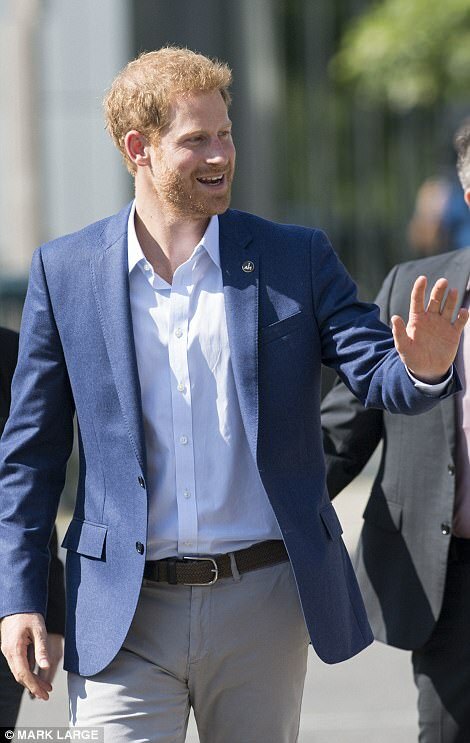 Later, 33-year-old Harry gushed over the Canadian city during a brief meeting with outgoing Governor General David Johnston. 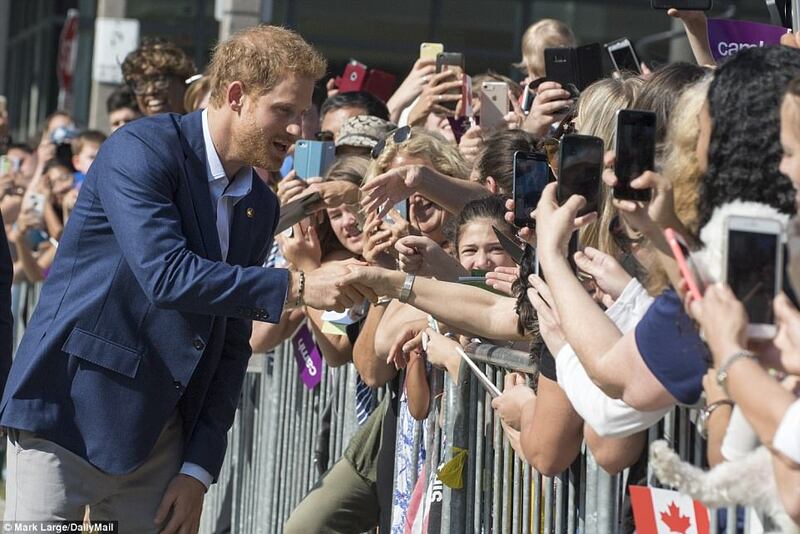 Toronto has won a special place in the prince’s heart since he began dating Suits actress Meghan Markle who keeps a home there. 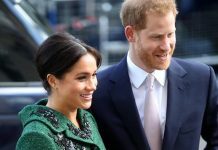 Harry, who has spent quiet weekends there with his girlfriend and her dogs, told Governor General Johnston it had become a ‘home away from home’ for him. Mr Johnston is standing down at the end of the month after seven years in the job to be replaced by businesswoman and former astronaut Julie Payette, who last week met the Queen at Balmoral. 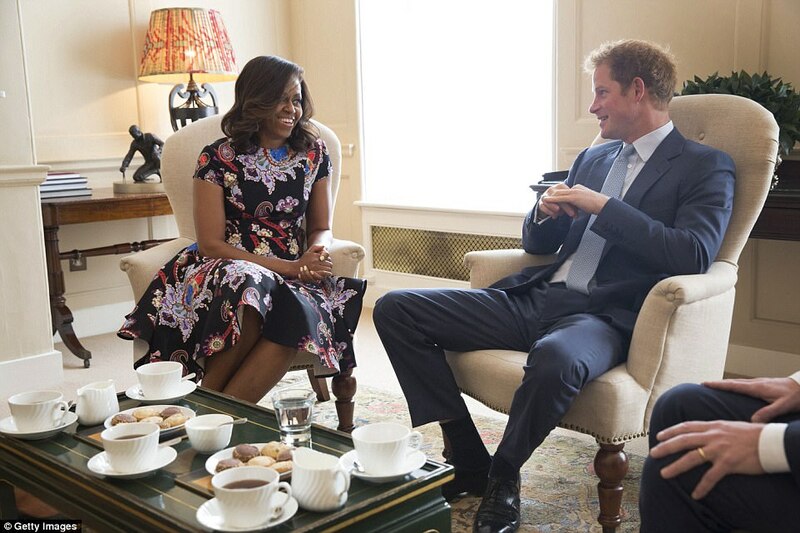 During their formal meeting earlier in the day, Harry and the US First Lady then settled down to discuss the Invictus Games’ success. 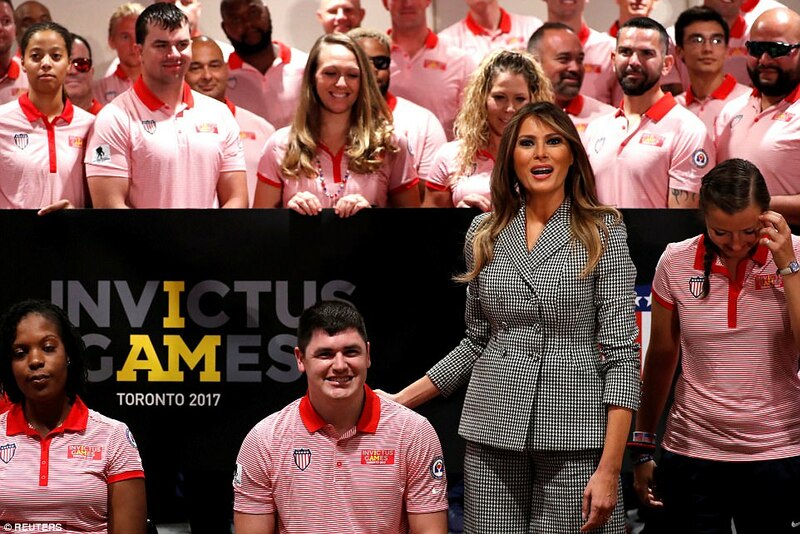 Subsequently Mrs Trump moved on to meet some of the veterans taking part for Team USA in the games while Harry moved on to a meeting with Canadian Prime Minister Justin Trudeau. 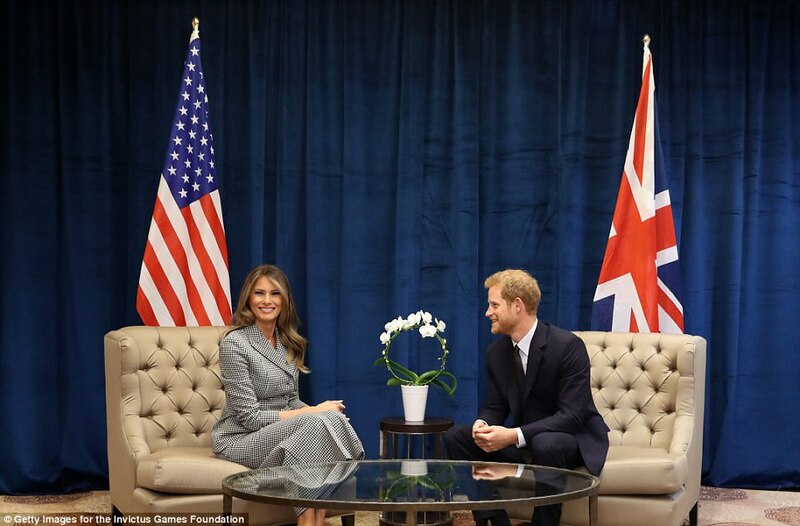 Mrs Trump is leading the US delegation at the international sporting event in her first solo foreign trip and the first known meeting of a member of the royal family with a member of the Trump family since the election. It’s not the Trumps’ first encounter with royalty, however. 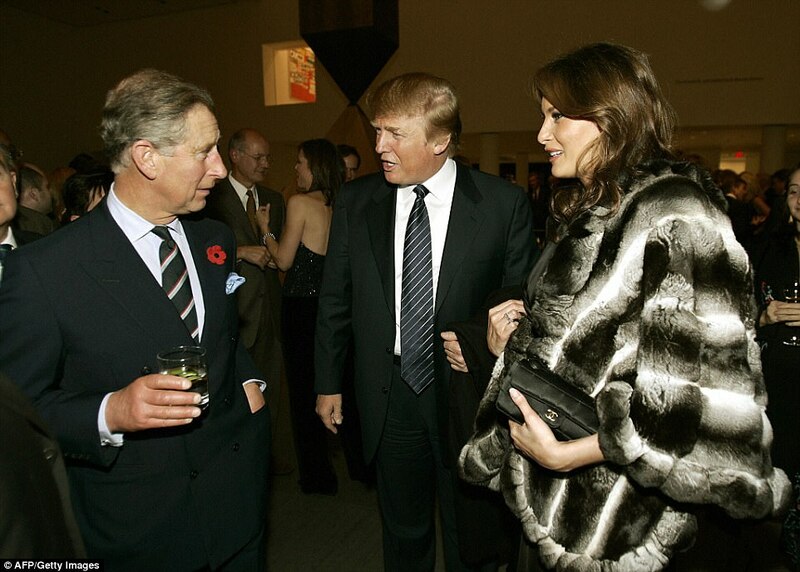 In November 2005, the President and First Lady – then just a newlywed couple – met Harry’s father, Prince Charles, during a reception at the Museum of Modern Art in New York City. Her decision to lead the American delegation, whose members include Veterans Affairs Secretary David Shulkin, professional golfer Nancy Lopez and entertainer Wayne Newton, reflects the first lady’s ‘utmost respect’ for the hard work, courage and sacrifice of the US military, said Stephanie Grisham, a spokeswoman for Melania. ‘She feels strongly that they – and their families – should be honored every day,’ Grisham said. 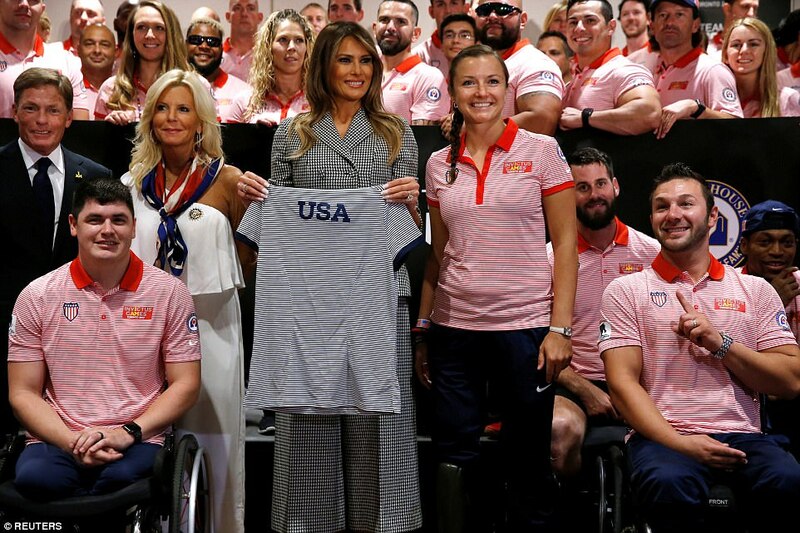 Later in the afternoon, Mrs Trump returned to the Sheraton to take part in a reception with Team USA athletes where she made a brief speech that lasted less than two minutes. In the address, she said: ‘Invictus means unconquered and pays tribute to your fighting spirit. You have given so much for your country. You truly are our heroes. On behalf of my husband and our entire country, I want to thank you and your families for all you have sacrificed to keep us safe. I also want to wish you good luck but I know you won’t need it in these games. Take that fighting spirit that I know you have and bring home the gold. 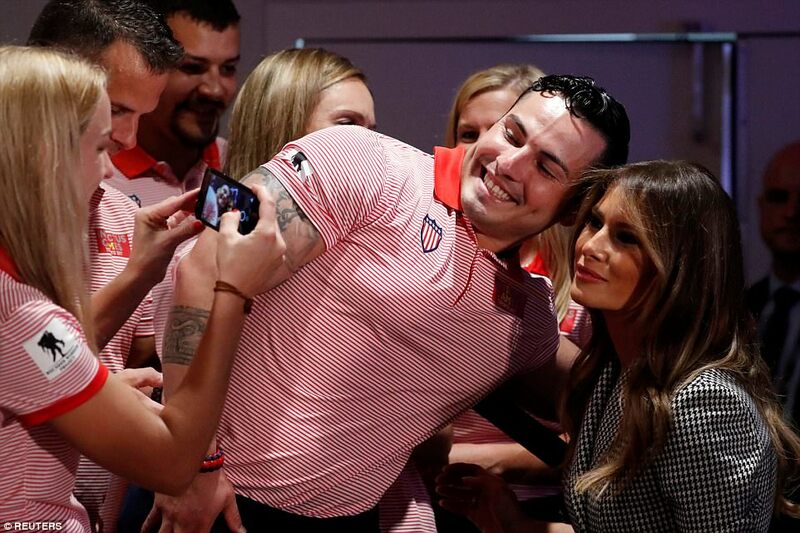 Following her remarks, FLOTUS shook hands with several athletes, including a seven or eight who approached her and asked for individual photos with their cellphones. 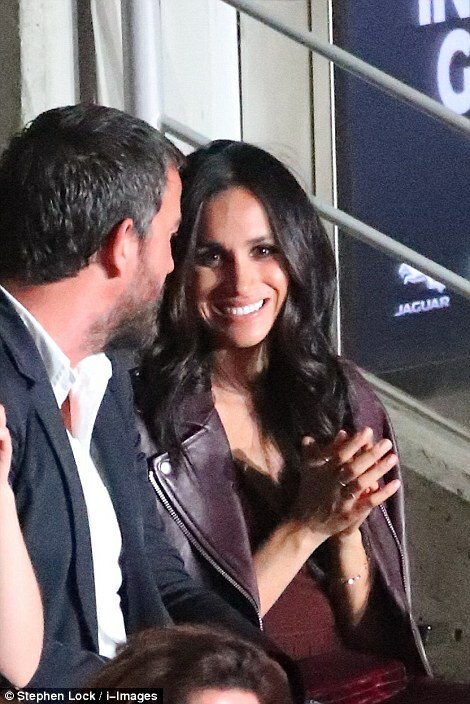 Following his meeting with the First Lady, the Prince attended Jaguar Land Rover Driving Challenge, where competitors race either Jaguars in a speed and precision course or Land Rovers in an obstacle course. 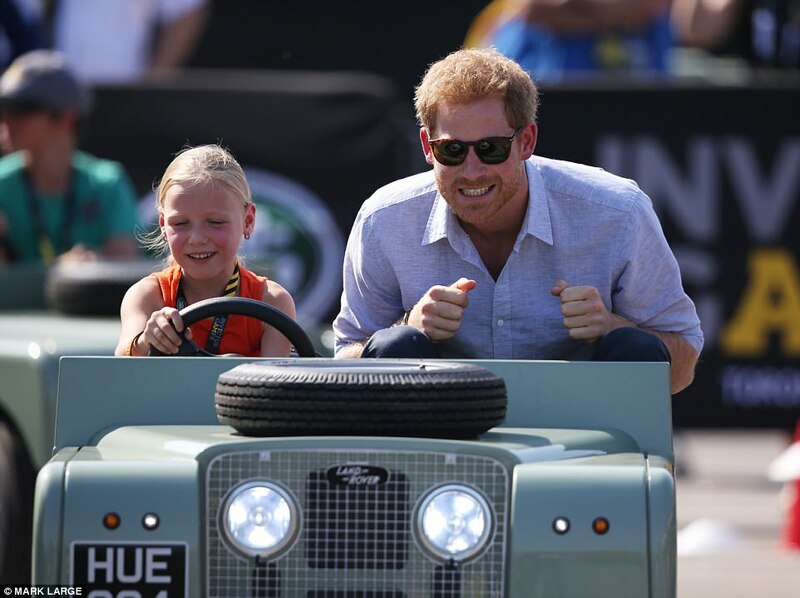 Harry was all smiles as he was sent on a spin in a miniature Land Rovers with little Daimyb Gommers. 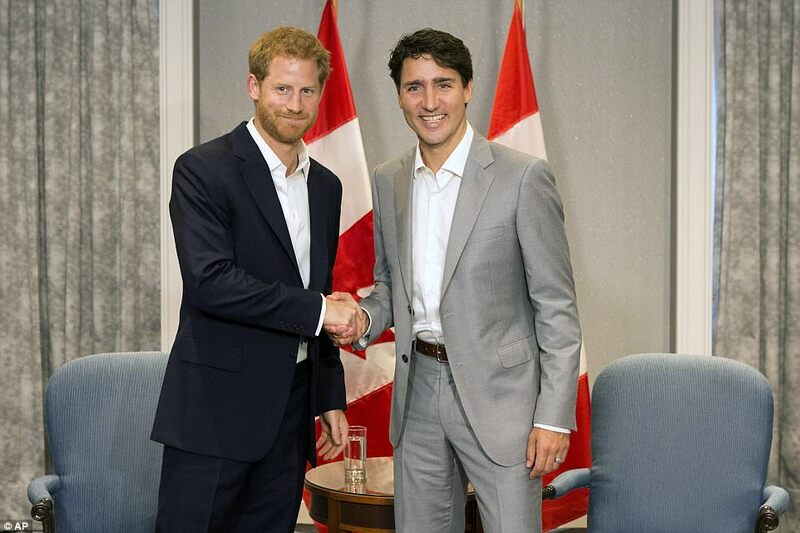 He then moved on to a meeting with Prime Minister Trudeau, who is also a friend of Meghan Markle. ‘There’s a real buzz across Toronto – everyone’s getting into it,’ he said. 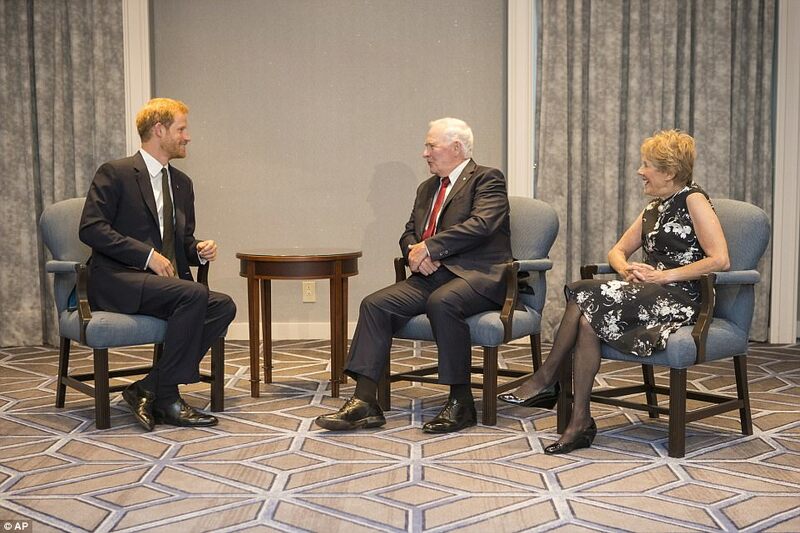 And as the press were summoned out, Harry put aside his airs and graces and leant in to whisper Trudeau a joke – which made him loudly splutter with laughter. 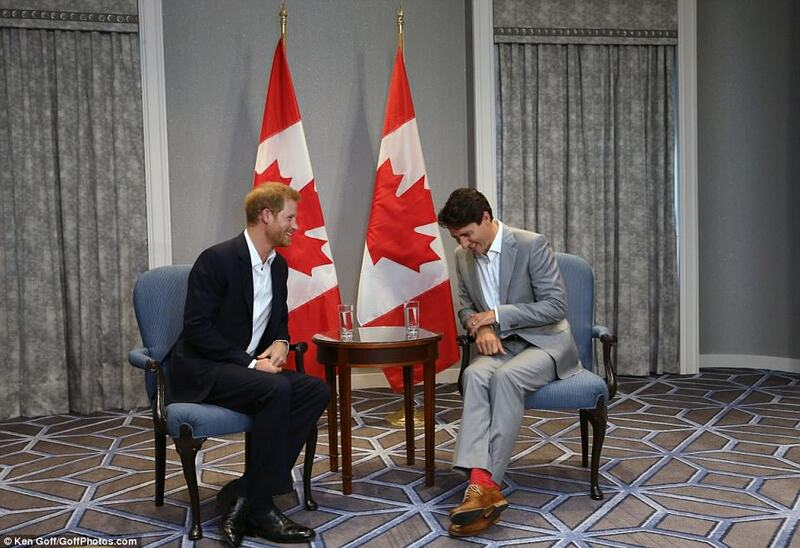 Trudeau – who has a famously flamboyant taste in socks – had donned a bright scarlet pair for his meeting with Prince Harry. 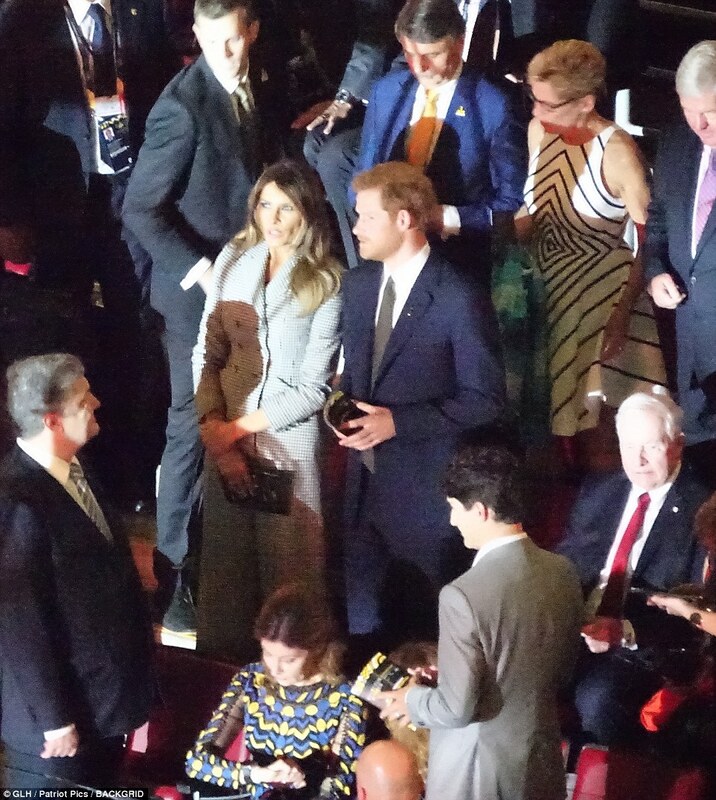 The powerful duo had a clear rapport when Harry flew out to promote Invictus in Toronto last year. 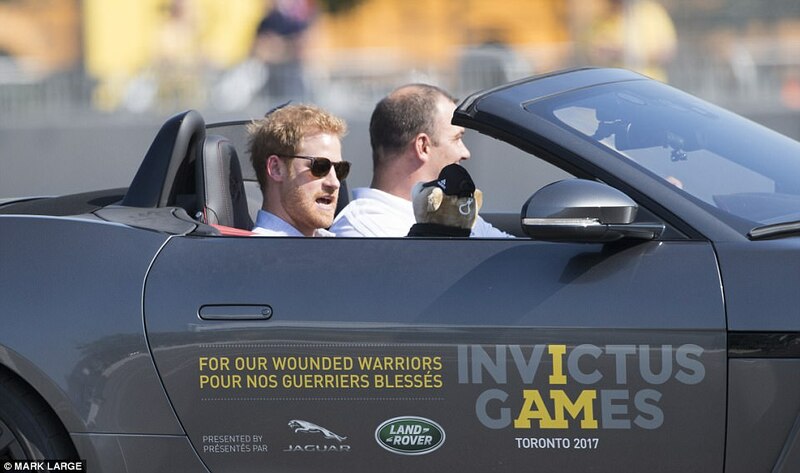 The various meetings and events come ahead of the opening ceremony of Invictus Games, games for wounded service personnel, where he is expected to make his first public appearance with actress girlfriend Meghan, 36. 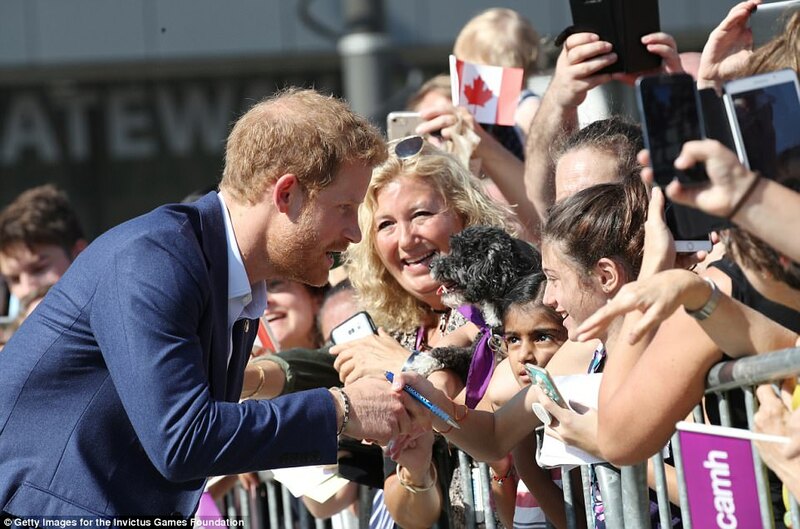 Earlier that morning, the Prince who was greeted by crowds of adoring fans – and a even a couple of dogs – as he left following a meeting at The Centre for Addiction and Mental Health on Saturday. 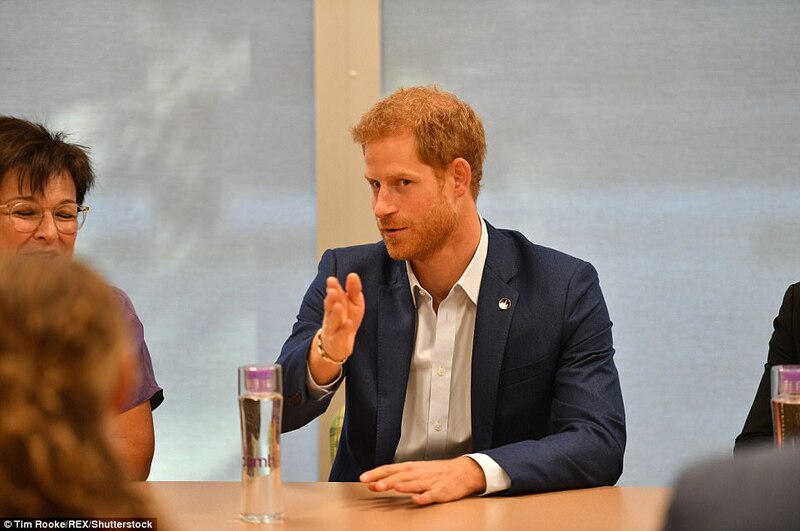 The royal had just come from meeting with healthcare workers at Canada’s largest mental health and addiction hospital to discuss their work in research and technology with a focus on young people. Among the topics discussed at the round table discussion was potential preventative cure to stop soldiers suffering from PTSD, closely tying the work to upcoming Games. After being told one of the center’s main approaches is prevention, the prince told doctors: ‘It seems we suffer from a culture where a pill will fix everything. ‘There has to be a better way than just giving out anti-depressants. 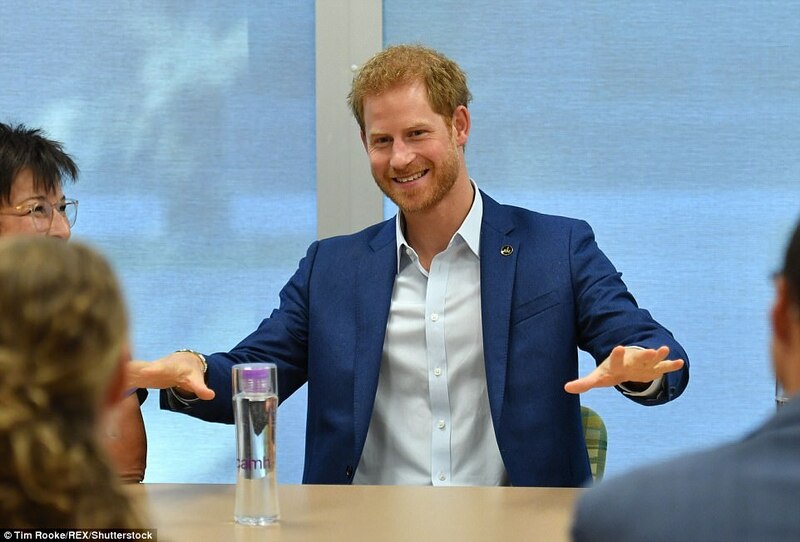 During a round-table discussion about mental health research, Dr Fang Liu told Prince Harry that her team has discovered a protein complex which could lead to a potential anecdote to prevent soldiers from suffering from PTSD. It is now being tested on ‘animal models’ and could one day be given to soldiers as a pill. 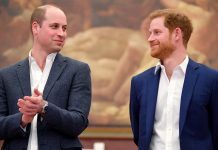 The young royal was also praised for his work in raising the issue of mental health and helping to reduce the stigma. Prince Harry’s mother Princess Diana also visited the center in 1991. 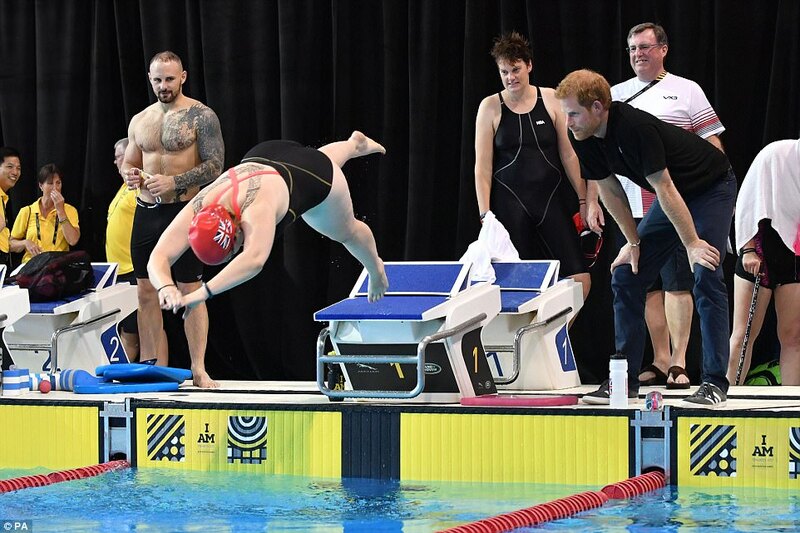 Yesterday, the prince visited the Pan Am Centre to watch the swimmers being put through their paces, stopping to give a hug to runner Kristin Lane, 23, from Brisbane, Australia. Lane, who had been dozing when the Prince arrived, told DailyMail.com: ‘He woke me up and then we just embraced. I’ve met him a couple of times before so he must have recognized me. The athlete told DailyMail.com that he spent four years in the Army before being injured. He received a medical discharge two months ago but said the Games is helping him to adjust. Lane said: ‘Being here is awesome – the whole journey has been really good and it’s great being here with all the guys.’ The 23-year-old will compete this week in the 100, 200 and 400m events. 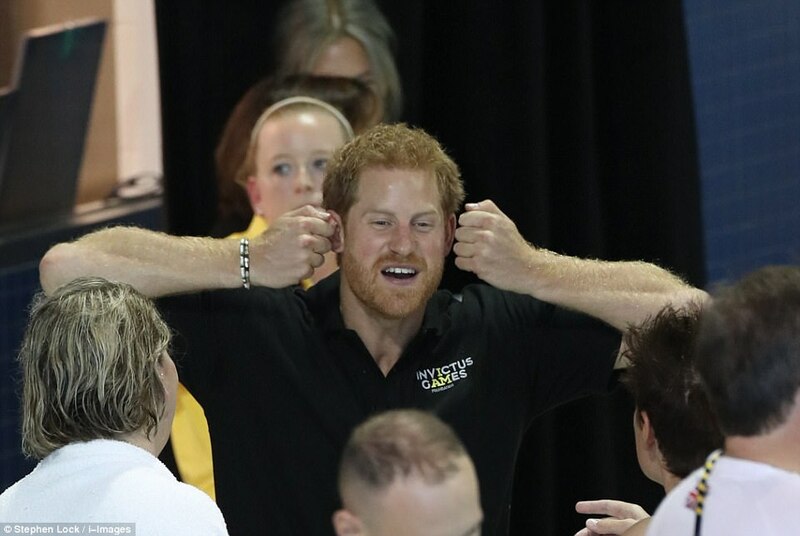 Harry also joked with a group of Australian swimmers, laughingly pretending to drop kick a kangaroo mascot into the pool. Coach Amy Beal, 33, of Perth, Australia, added: ‘He was joking about our boxing kangaroo – his name is Skip but Chris’ son calls him Roger. ‘Rodger is going everywhere with Chris during this trip. 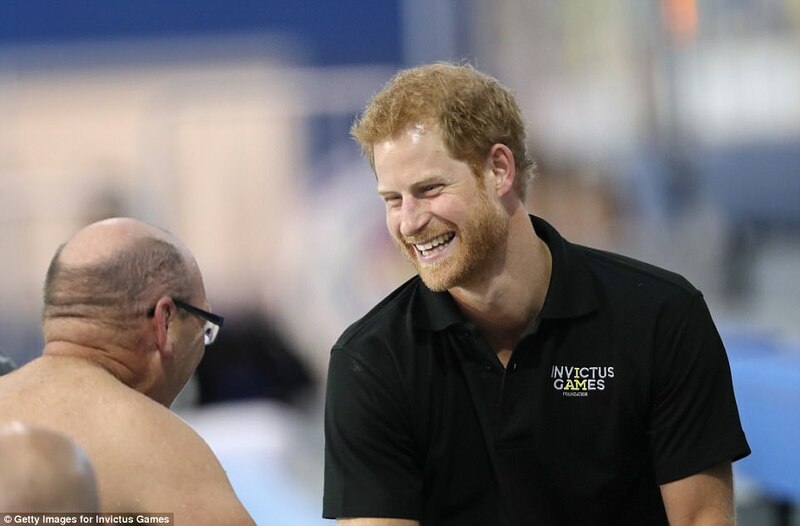 The engagement, Harry’s second of the day, was at the Pan Am Centre – the venue for the swimming and rowing competitions. As well as Team Australia, athletes inside the venue came from all 17 competing nations, among them Team USA and Team GB. 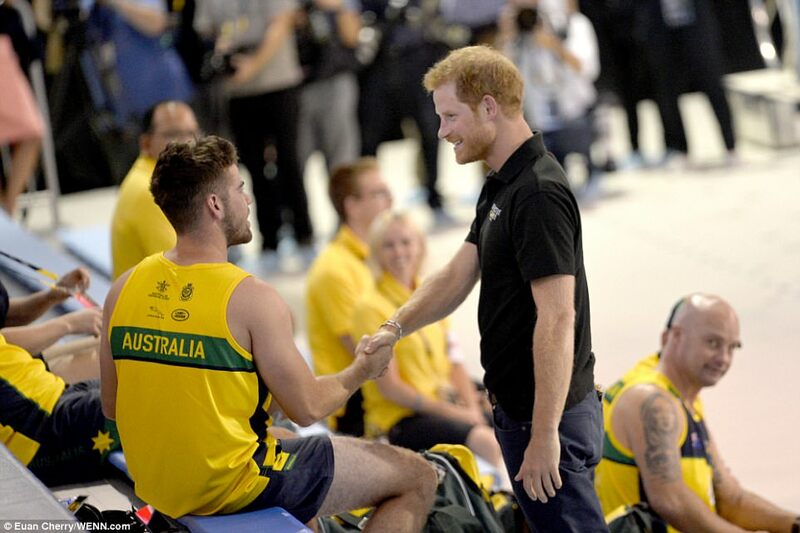 Beal said she and other members had previously met Harry during the Sydney Invictus Games launch in June and said he had remembered him. ‘We met him in Sydney for the launch in June so he recognized us,’ she said. ‘He was talking about jet lag because he knew we had come all the way from Australia, plus our prep and whether we are ready. 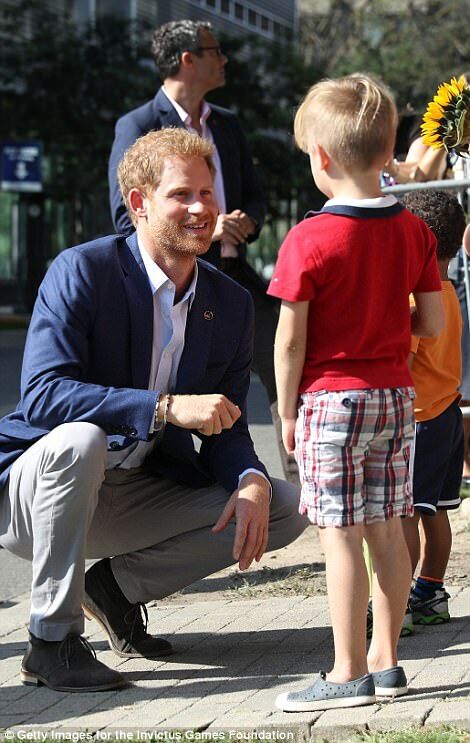 Harry’s first engagement of the day was at Scotia Plaza to attend the True Patriot Love Symposium; an annual meeting that brings together representatives from non-profit foundations, business and government to discuss how best to help military veterans and their families. The agenda at this year’s event, which was being livestreamed online throughout the day, is focused on soldiers’ wellbeing during both peacetime and during war. 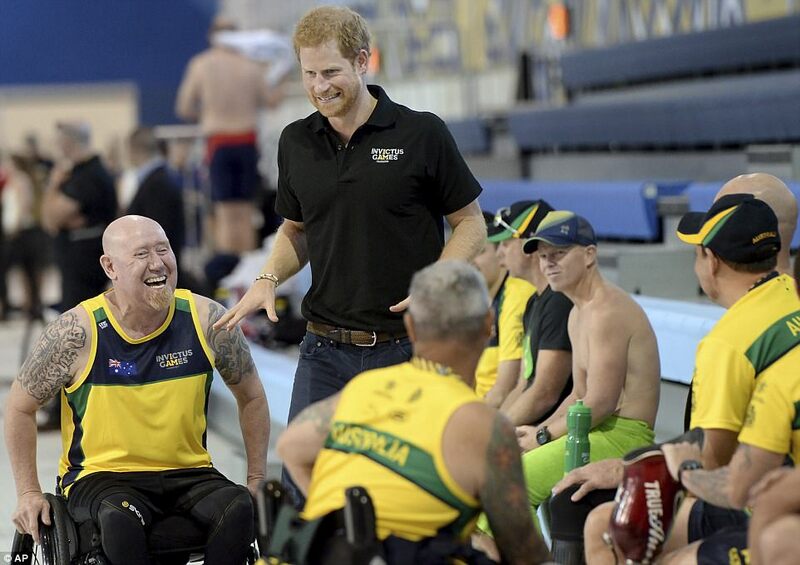 Harry spent part of the morning at the event, meeting Invictus competitors and their families who are taking part in a panel discussion. 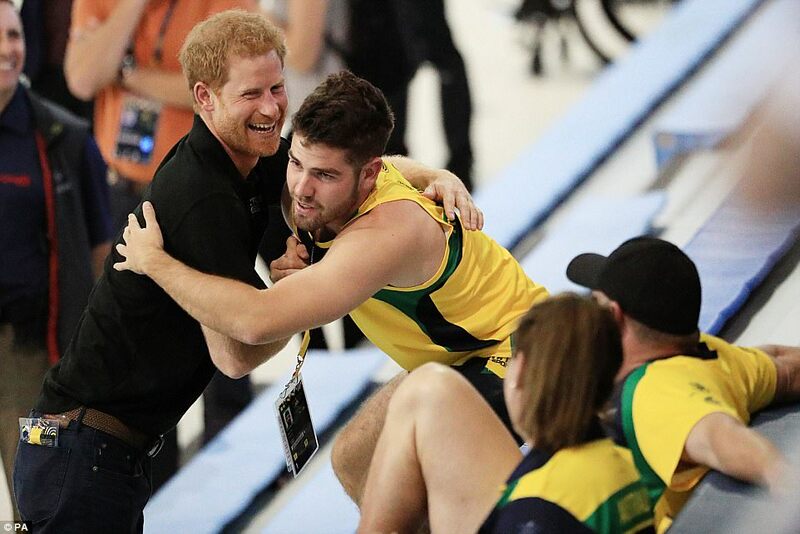 He congratulated a pregnant athlete who’s taking part in his Paralympic-style Invictus Games and was told she hopes to bring their baby to the contest next year. 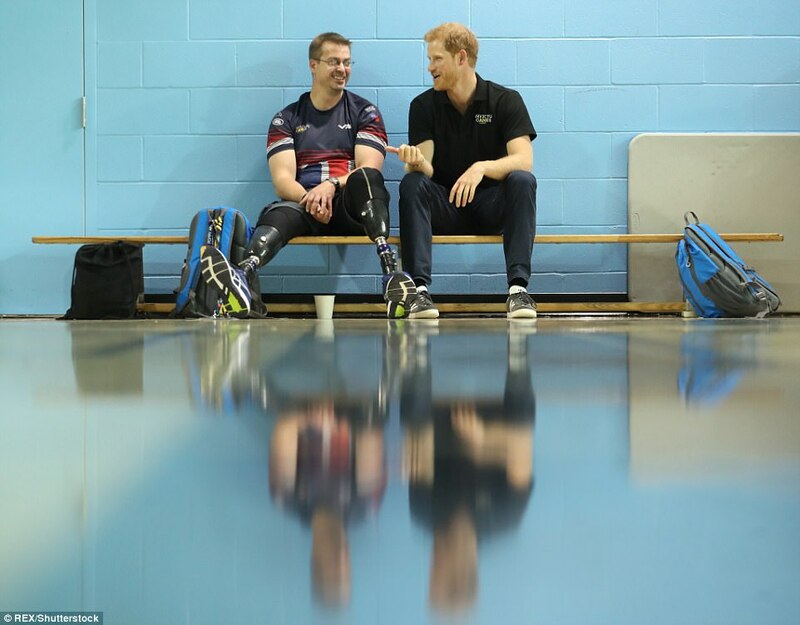 Harry, 33, met Randi Gavell who’s set to compete in several sports in the coming week in Toronto. 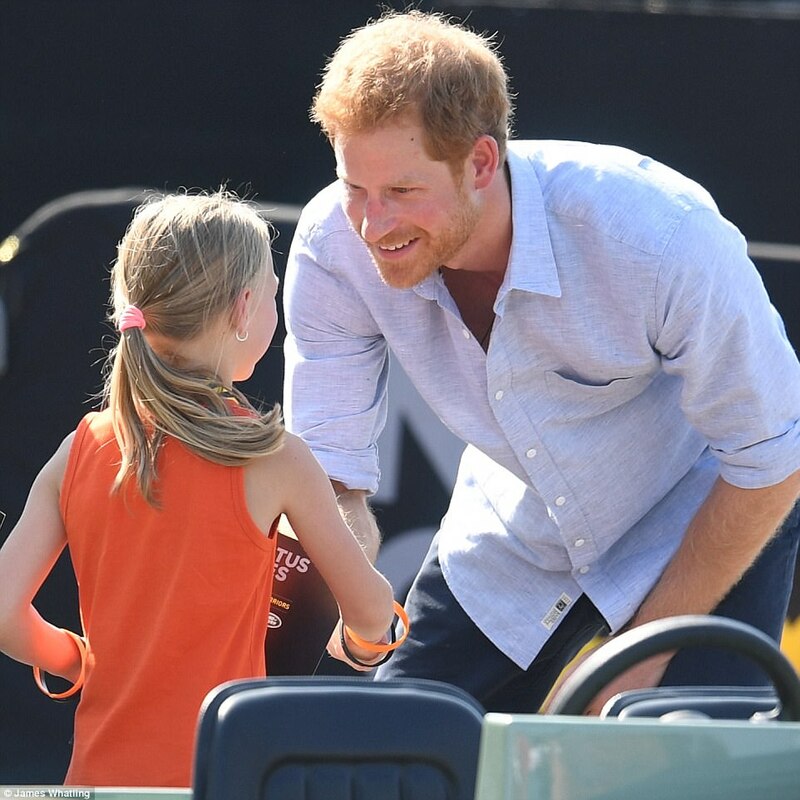 The former staff sergeant, who was medically retired from the US army in 2010 after suffering a traumatic brain injury following a truck bomb blast in Iraq in 2006, is expecting a girl, she told Harry at a meeting with families at a special pre-games conference. ‘The first question I asked my doctor was if I could still go to Canada,’ she told Harry when he congratulated her.